As the betting industry continues to expand, there are more and more wild and wonderful new bet types being created. Scorecast and Wincast are two such examples and although it isn’t easy to get wins out of them, it can be extremely lucrative when you do. The strong odds combined with the money back offers that are often attached have successfully lured many a hobbyist bettor to their doom, but if you do a bit of homework you can come away with a much better chance of winning. These bets have become particularly popular as a way of getting higher priced markets on typical football matches where your more traditional bet types don’t offer much to get excited about – but are they really worth it? What is a Scorecast Bet? It’s a play on the word forecast, geddit? There are two major tasks on your hands here; firstly, you have to correctly select the first goalscorer which is a bit of a job in itself; and second, you have to select the final score after 90 minutes. It is classed as a single bet but both of these selections need to come in for you to win. The odds here are lengthy but that’s obviously for a very good reason, your chances of getting this right are slim. On the flip side, you can wager pennies and get pounds in return. In a recent game between Everton and Man City, the smallest odds available were 22/1, and that was for a 2-0 win to Man City with Sergio Aguero (striker) scoring first. The returns from even a 50p bet on that would cover a couple of pints and a packet of nuts. Change that result to a 2-1 win to Everton and the odds shoot up to 220/1. With so many variations, then, how do you decide what to do? This will depend on you as a bettor and on the two teams who are facing each other on the day. There are a lot of variables and this is where research comes in. Start with the result. Look at both teams current form, any missing key players, their records at home or away depending on the match/team in question. This should shed some light on who is most likely to win. Now look at scoring and each teams strong points and weak points and how they affect each other. Is the game likely to see many goals going on previous performances, is one team famous for keeping clean sheets at home, does one side miss a lot of chances, etc. Anything that is relevant to that specific game. For instance, we can see that Man City are netting 3 goals per game fairly often but allow their opponents to catch them up. Then you have to decide who will score that first goal. Consider who the penalty takers are, who is responsible for set pieces, who is currently on form, if players regularly score away from home. The obvious choice would be to go for an attacking player, but maybe you think a certain midfielder with better odds might knock one home? Going for a defender is a bold move but if there is someone who regularly comes up for corners and is good in the air it might be worth a small wager for the higher odds on offer. This shows us that Aguero is certainly capable of scoring (he hasn’t scored fewer than 20 in a season since 2013/14) but he has only netted in three of the last eight games, and only once in an away game. However, he scored a hattrick a few weeks back. What would you do? Anytime Goalscorer – It’s the same thing really except you need the player to score at any point in the match rather than first. This makes it an easier bet to win so the odds will be shorter, but should still be attractive. First Half Score – This variation plays with the other end of the bet, the score. Instead of betting on the full time score, you bet on the score after 45 minutes. Therefore, your bet will end at the half time whistle. They aren’t always available but where you do find them they can provide an interesting alternative and a less risky option if you are risk averse. Remember, with a bet like this, own goals don’t count. If a player makes a right mess of it and deflects one into the back of his own net for the first goal of the game, that’s bad news for them but means nothing to you – the first goalscorer part of your bet is still intact. Remember also that only the regulation 90 minutes plus injury time counts. Anything that happens in extra-time is irrelevant when it comes to settling the bet. Aside from that, there are also one or two tactical approaches you might consider in order to get the most out of these sorts of bets. Tricky as they may be to win, there are ways to minimize your losses and hopefully maximize your returns as you go along. Maximum Potential Loss = £4. Minimum Potential Return = £22. Maximum Potential Return = £43. Go International – With so many obscure games available to bet on – you know those Australian fixtures that kick off at about 4am – you can take bet on games from all over the world. Some international leagues can be easier to predict due to there being fewer teams in each league or the dominance of on or two clubs in particular. Some of these get far less attention from bookies so odds aren’t scrutinised in the same way, which means a bit of work from you in the research department can pay dividends. Bet Small – Your bet can die very quickly in this arena. It’s an incredibly difficult market in which to succeed so keep your stakes small to avoid disappointment and an evaporating bank roll. Returns on a successful bet of only a few pounds can be the equivalent of a day’s wage, so you really don’t need to be throwing twenty-pound notes at scorecasts. What is a Wincast Bet? 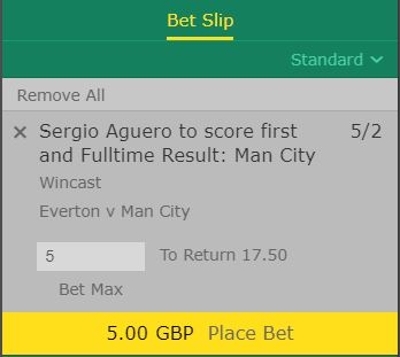 So using our Everton v Man City fixture, you could go for City to win and Aguero to score first. Simple. One half of the bet is the same but the other is much less specific (the result), and so the odds will reflect this. While the odds might not be quite as high, for those of you that find the scorecast too improbable or don’t fancy doing quite so much research this is a fantastic alternative. It can save a lot of heartache after you have correctly predicted the first goalscorer, too. If you want to bet small it’s probably best to go for a bit of an outside chance to see any real returns, but if you are happy to bet a little more you can see profit that is worthy of your time here. What is a Timecast Bet? This bet does away with the final result altogether and instead focusses on goalscoring. You will still have to choose which player you think will score first, but you then need to decide when that goal will come. This part of the bet replaces the final score prediction and is usually split up into three parts: 1-20 mins, 21-45 mins, 46 mins and over. This makes the bet a little less scary but exciting nonetheless. This one isn’t as popular or as readily available as the scorecast, but it’s worth considering if you have a good deal of personal experience watching a team who tend to score early for example, or if you can find some stats that support a potentially slow burning fixture with a particular player that often comes to life in the 2nd half. Giving stakes back as a free bet is a popular tactic of many online sportsbooks to attract and retain customers. Scorecasts etc can be included in these offers although they will vary from bookie to bookie. Sometimes you might get your stake back as a free bet if the match is a bore draw (0-0), or if a pre-determined player scores first (and you didn’t bet on him, obviously). You may have lost your bet, but you still get a free bet by way of commiseration, and that free bet could be the one that bags you your next win. Equally, it might come to nothing, but at least you have the chance. So look out for these offers and always take advantage of them when they are available, as there is literally nothing to lose from the punter’s point of view. These bets aren’t at all easy to get a return on. Winning bets like first goalscorer and correct score aren’t easy tasks individually, so combining them is even harder. That’s why the odds are attractive, though, so a bit of research and a healthy dose of luck go a long way to seeing these wagers come in. 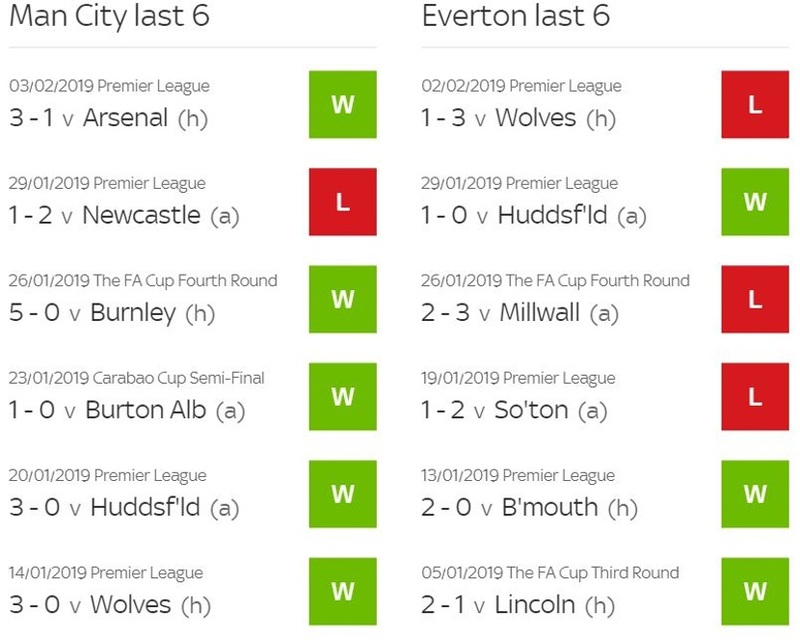 The great thing about them is you can stake low amounts for high returns; it might be unlikely for Leroy Sane to score first and Everton to beat Man City 2-1 but it has odds of 250/1 – you won’t notice a £1 bet on that, but you will notice the winnings.